This is a simple picture book encouraging empathy for animals and both my young grandchildren loved it. It can sometimes take a few reads for young children to identify with a book but this one had instant appeal. 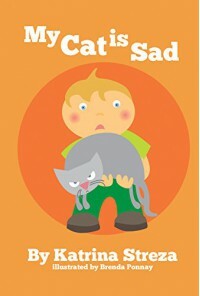 The little boy in the book obviously loves his cat, but he's sure that it needs cheering up. He tries all the things he thinks might work, but nothing seems to help - until he decides that what the cat needs is love. Clear, easily understood illustrations by Brenda Ponnay, add to the simple narrative. There are currently three other books in the series: My Good Dog, My Cat, my Dog and My Cat is Fat.